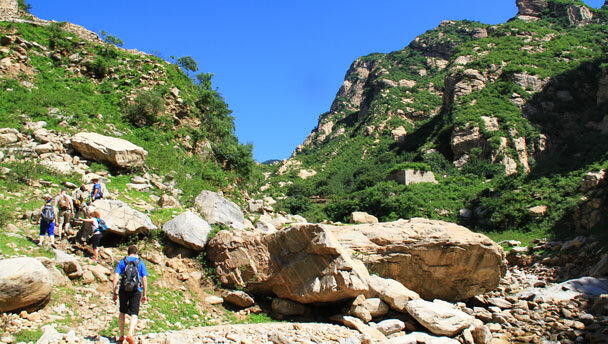 In Brief: The reversed version of our Great Flood hike, hiking up the Yunmeng Gorge and then crossing the mountains and hiking out a boulder-filled valley. Hiking up a bouldery canyon. Start off with an easy walk up the scenic Yunmeng Gorge, then cross the river to hike up into a valley filled with (mostly) fallow terraces before climbing to cross a pass in the mountains. The hike finishes with a long walk out a boulder-filled river canyon, with great long views. We named this hike the Great Flood after hearing the story of a flood that washed out the only road up Yunmeng Gorge, leading to the abandonment of the village at the end of the road. The road has since been fixed up, but you can still see some of the remains of the old road that was washed into the river. We begin the hike by walking up the new road, following the course of the river as it winds through the tall cliffs and mountains of the canyon. Yunmeng Gorge is a lovely spot for swimming and camping in the summer, and it’s also popular with climbers. After an easy and mostly flat walk of 5km we’ll cross the river at a shallow ford, and hike up a dirt road to a tiny two-house farming settlement. The settlement is at the bottom of a broad valley, and all the terraces and trees show that it was farmed quite intensively back in the day. We’ll continue past the two houses – looking out for pigs, donkeys, and goats – and hike up through the terraces, getting further into the mountains. Eventually the hills get too steep for terracing, and that’s where we start the climb up over. It’s not a super-tough climb, as we’re only gaining about 140m of elevation, but there are a few steep section, and the trail is a wee bit slippery. We peak at about 690m, and then start the descent that takes us to the end of the hike. The first part of the descent is through a forested region, on zig-zag trails that make it slightly less steep. We come out of the forest into a boulder-filled valley and pick a path through the rocks, passing pools of water and small streams. This is one of the most scenic parts of the hike, and a great way to finish the walk. The middle part of the hike could be overgrown and bushy. 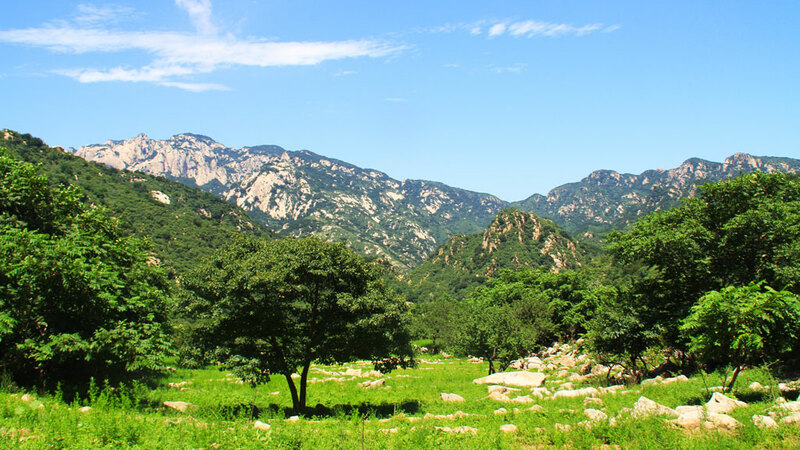 Photos of mountains and water on a blue sky day in Beijing. On June 6th we headed out to Miyun County for the Great Flood hike, a very scenic trail that had us following rivers through boulder-filled canyons, climbing a steep valley, and walking through grassy meadows on the way to a village that was abandoned after a particularly large flood. Click through for photos and stats from the hike.